Four bars in I knew it wasn't! Absolutely delightful example of today's Brazillian jazz. Cabral, a young pianist based in Sao Paolo, is a real find. Sensitive, explorative and, behind Vanessa Moreno, as sympathetic an accompanist as any singer could wish for - and Moreno isn't just 'any singer' but a sultry serenader reminiscent of Astrud Gilberto. The addition of Cássia Ferreira on sax adds to the ambiance of the track. I'm not sure if Cabral the drummer is related to Cabral the pianist but the intuitive touches they share suggests he may be and Vieira is undoubtedly a musical blood brother. 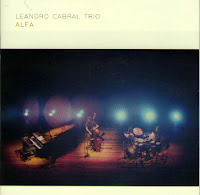 Described as his sophomore album (that means his second) the Leandro Cabral Trio's Alfa is now available. Bebop Spoken Here's Post of the Year. In the Mood for the Glenn Miller Story? Merry Christmas to Jazzers Everywhere. What the Dickens? A Jazz Christmas Carol!!! CD Review: Newport All Stars - Tribute to Duke. EP Review: Medeljazz Quartet - Yesternow. CD Review: Chris Ingham Quartet - Dudley.